01/09/19 Settlement Reached Ending Litigation. On January 9th, PVHA, PVE City Council, CEPC, ROBE and Lugliani all signed and executed a comprehensive settlement agreement which ends both the CEPC/Parklands litigation and the ROBE Quorum litigation against PVHA. This agreement requires the removal of all encroachments on the portion of the Panorama Parklands visible from the street and returns it as parkland, confirms that PVHA and The City of PVE will respect the deed restrictions that prevent any future sale of parkland, and increases the acreage of deed restricted parklands by 2.6 acres by applying “parkland forever” deed restrictions on over 4 acres of open space in Bluff Cove. It also protects the PVHA and the City of PVE (if we had pursued this to trial and won against the City) from about $2 M of potential liability -- $500k for reversed sale, $1 M for Lugliani’s legal costs after relying on the PVHA’s warranty that it had the power to sell parkland (which the Courts concluded it didn’t), and legal costs moving forward. Finally, it requires the PVHA to actively ask the court to lower the quorum for Director Elections from 50% to 35%, places two ROBE candidates on the Board, and makes certain other election process reforms that will promote democratic elections. For the settlement, click here. For an explanation of the benefits to the public, click here. For a presentation with the photos of the subject properties, click here. 10/23/18 ROBE Sends Open Letter to PVHA Board Explaining Why ROBE Has Not Gathered Petitions This Year. This letter asks PVHA to place the ROBE candidates on the ballot again this year without requiring 100 signatures affirmed by a public notary (as ROBE candidates have done in each of the last three years) — a requirement that the PVHA Board incumbents refuse to follow themselves even though their Resolution 177 requires them to do so and the PVHA attorney promised Judge Kwan the PVHA Board members would submit signatures in this election cycle — click here. 2/6/18 ROBE Delivers Mailer about Extended Election to Mailboxes of PVHA Members: As a reminder that the extended election closes on Feb 8th, ROBE sent a postcard to all PVHA members. For the postcard, click here. 12/14/17 Appeal Court Hears CEPC’s Panorama Parkland’s case -- The three justices who are handling the appeal are Judith Anderson-Gerst, Victoria Chavez and Allan Goodman; oral arguments were heard on December 14. At the hearing, they only asked a few questions of the appellate lawyers (representing the City of PVE, the PVHA and the Lieb Trust/Lugliani Family) and none of the respondent. I am told that in Appellate hearings a lack of questions sometimes suggests that the three justices may have already made up their minds. A written opinion will be issued within 90 days, although our district Appellate Court often responds within 45 days. For audio of the arguments in court. click here. The ruling will be posted at www.pvegoodgov.org as soon as it is available. 12/8/17 Transcript of Court Hearing on Reducing Quorum Released. The transcript of the first out of chambers hearing for the lawsuit by ROBE to lower the quorum was released, and in it Judge Kwan indicated her preliminary thinking. For the transcript, click here. For a condensed version of most interesting excerpts, click here. 11/30/17 Court Hearing on Quorum Lawsuit. We had our first court appearance in front of Judge Ruth A. Kwan, who asked questions and indicated her current thinking. PVHA attorneys had argued that Ried Schott did not have standing as a PVHA member to ask the court to intervene in lowering the quorum without the endorsement of the PVHA Directors; Judge Kwan disagreed and said Schott did have standing based on her interpretation of Corporations Code section 7515 (for the code, click here). On the merits, Judge Kwan addressed Board President Phil Frengs in the audience and expressed disappointment that the Board was not doing enough to allow a valid election to occur. In particular, she said the Board could extend the election when a quorum is not reached by the Annual Meeting because that is an option according to the by-laws; she suggested sending additional mailings after such an extension to encourage achieving a quorum – rather than incumbent directors re-appointing themselves to serve another year as has been past practice. She took no action, but set a hearing date for February 15, 2018 to review the outcome of the 2018 election and make a determination then. Judge Kwan said that if a quorum is not met in the coming election, then she was inclined to intervene to lower the quorum from 50%, but not as low as the 25% in the Plaintiff’s request. She said she was not predisposed to grant any of the other specific actions sought by the plaintiffs beyond lowering the quorum. To read the transcript of the hearing, click here. 11/22/17 PVHA Files Additional Briefs In Quorum Case. PVHA filed three additional documents in the Lawsuit to Lower the Quorum Requirement. For the Opposition to Petitioner’s Brief, click here. For the Declaration of Sidney Croft, click here. For the Objections to Petitioner’s First Amended Petition, click here. Basically, PVHA is attempting to negate the factual evidence presented by ROBE that prove multiple misrepresentations in PVHA Attorney Sid Croft’s sworn declaration; PVHA is doing so by asking the Court that all references in John Harbison’s Declaration (click here) to newspaper articles be dismissed as “hearsay”, and that all references to direct quotes from PVHA ‘s Board Minutes be dismissed because copies of the minutes were not submitted to the Court. ROBE finds this astonishing since Harbison asked PVHA for permission to make copies of the minutes and was forbidden from doing so by PVHA from doing so. PVHA is not presenting facts that argue otherwise, but rather are hoping that the Court believes its misleading and inaccurate statements without facts to support their assertions. 11/17/17 ROBE sends postcard summarizing the need for new Leadership to all PVHA members. For the postcard, click here. Please attach it to an email and send to your friends encouraging them to vote. 11/15/17 Court Accepts California Association Realtors Amicus Brief in CEPC Panorama Parklands Case. For the notice, click here. 11/14/17 ROBE counsel sends letter to PVHA counsel about election process concerns. After issues with the ballot mailins last year (where PVHA made multiple errors in the ballot that caused confusion among voters), in recent weeks ROBE has offered repeatedly to review the ballots before they are printed. PVHA ignored that and has sent the ballots to the printer. Further, once again, PVHA incumbents have failed to comply with their own Resolution # 177 passed on May 24, 2016 that requires all candidates to collect signatures via petition in order to be listed on the ballot (click here). ROBE's attorney sent a letter to PVHA's attorney to point out these concerns -- click here. The response was underwhelming and reinforces the ongoing disregard by the PVHA for its own Rules and Regulations, asserting that the incumbents are not required to gather signatures even though their published Resolution says otherwise -- click here. Three of the incumbents have never been elected and the other two have not been elected since 2009 and their terms have long since expired. In contrast, incumbent PVE City Councilmembers who decide to run for re-election must gather 25 signatures just as any new candidate would. Therefore, from our perspective, the PVHA incumbents should not be listed on the ballot since they did not gather the required signatures via petition. 10/26/17 Schott/ROBE files Petitioner Brief Summarizing arguments in the Quorum Lowering Case -- For the Petitioner's Brief, click here. For the Declaration of John Harbison in Support of Petitioner's Brief that is referred to in the brief, click here. 10/18/17 ROBE submits nominating petitions collected from 190 PVHA members for ROBE's four candidates -- 100 signatures were required per candidate. We were told that for the second year in a row, the incumbent PVHA Directors failed to comply with their own Resolutions #177 which requires ALL candidates to submit petitions containing at least 100 signatures. Only 2 of the 5 incumbents have ever been elected, and the two that were elected prior to the last legitimate election in 2009 had terms that have long since expired. Note that incumbent PVE City Council members seeking re-election must obtain 25 signatures. Also note that over the past three years, 442 different PVHA members have signed nominating petitions for ROBE's candidates. For bios of the ROBE candidates for the January 9, 2018 election, click here. 10/17/17 Court Hearing Set for November 30th at 9am -- It is open to the public. 10/13/17 Schott/ROBE Files First Amended Petition to Judge Kwan's Concern -- For the petition, click here. 10/10/17 Court Asks ROBE to Re-file Amended Petition -- Judge Kwan takes issue with the phrasing of the first sentence of ROBE's petition, and indicates that any member (such as Ried Schott) can bring a petition on behalf of the PVHA but ROBE cannot be the plaintiff because ROBE as an entity is not a member. As such, the Judge dismissed the Petition without prejudice, and indicated that we can refile an amended petition with the language she seeks, and then a court hearing can be set without starting over with briefs again. For the Judge's ruling, click here. 10/2/17 ROBE files Petitioner's Reply Brief -- For the final brief filed by ROBE that repudiates many inaccuracies and misrepresentations in the Declaration of Sidney Croft in Support of Respondent's Opposition (below), click here. For the Declaration of John Harbison in Support of Petitioner's Reply Brief, click here. We remain concerned about how the PVHA's legal counsel continues to make so many false and misleading statements; these two briefs go through eight myths promulgated by the PVHA and their legal counsel, and include quotes from the PVHA Board Minutes as well as copies of Articles in the Palos Verdes Peninsula News that report what happened in the past 90 years of PVHA elections. Please note that the Homes Association prohibited us from making any copies of the Board Minutes, so that is why are only able to include transcriptions of relevant sections. Local history buffs, there is a lot of entertaining drama in these articles from 1928-1982 about past calls for regime change and updating the quorum requirement. 9/25/17 PVHA files Opposition to Petitioner's Brief -- For the brief filed by PVHA, click here. For the Declaration of Sidney Croft in Support of Respondent's Opposition, click here. 9/21/17 California Association Realtors files Amicus Brief in Support of Ruling in Panorama Parkland Case. Significantly, the CAR supported the Judge's conclusion that the sale of Panorama Parkland violated CC&Rs and deed restrictions and should be voided. Further, CAR pointed out that overturning the ruling on appeal would set a dangerous precedent that could have far reaching negative impact on communities and HOA's across California that rely to adherence to the CC&Rs and governing documents pertaining to each entity. Finally, they were critical of the PVHA's arguments that the Business Judgment rule exempted the PVHA from following their own rules. For CAR's full amicus brief, click here. The Amicus Brief was accepted on November 15, 2017. 1/24/17 ROBE Proposes to PVHA to Follow ByLaws and Extend Election. The election on January 10th did not yield a quorum, so the current Board has declared they will serve another year. The following week, ROBE’s Steering Committee and its candidates for the PVHA Board prepared a presentation on the shortcomings in the recent election and a proposal for remedying the situation. In summary, we advocated that PVHA follow its By-Laws and extend the election “day-to-day” until a quorum is reached. For the specifics, click here. At the January 24th PVHA Board Meeting, Director Dale Hoffman proposed that PVHA do that, and Carolbeth Cozen also voted in favor of that proposal. However, the other three Directors (Phil Frengs, Ed Fountain, and Carol Swets) voted against the proposal and the motion was rejected. ROBE is considering our next steps. 11/23/16 Two Errors in PVHA Ballot Reported to PVHA. On the ballot, PVHA misrepresented the years of membership by overstating incumbent Carolbeth Cozen by eleven years (15 years instead of 4 years) and understating petition candidate Marlene Breene by ten years (21 years instead of 31 years). This error was corrected in a postcard that arrived on or about December 3rd, although some people have reported the ink was smeared. For examples, click here. 2/11/16 John Harbison Comments on the PVHA Election Report: If the last ballot submitted by PVHA voters were counted (instead of the first ballot as PHVA did), all four ROBE candidates would have been in the top five vote getters. This is disappointing because PVHA Attorney Sid Croft stated on 12/26/15 in the Daily Breeze that “If (residents) want to revoke their ballots, they can come to the homes association and mark whoever they want.” For Harbison's comments, click here. 12/7/15 ROBE Delivers Over 150 Signatures on Petition to Nominate Slate of 4 New Directors: For the letter sent to PVHA President Mark Paullin, click here. 9/10/15 Parklands Committee considers re-routing a portion of the Paseo Del Sol Fire Road closure/re-routing, and the application includes a letter from PVHA President Mark Paullin stating that 'The Board of Directors supports the concept of the project". PVHA contends that they did not support the project. Read the letter and judge for yourself. The application clearly is intended to deny public access to the area, and is in conflict with the underlying deed restrictions that say "said realty is to be used and administered forever for park and/or recreation purposes only ." For the PVHA support letter, click here. For the complete application to which the letter was attached, click here. For letter containing John and Renata Harbison's comments on the proposal, click here. 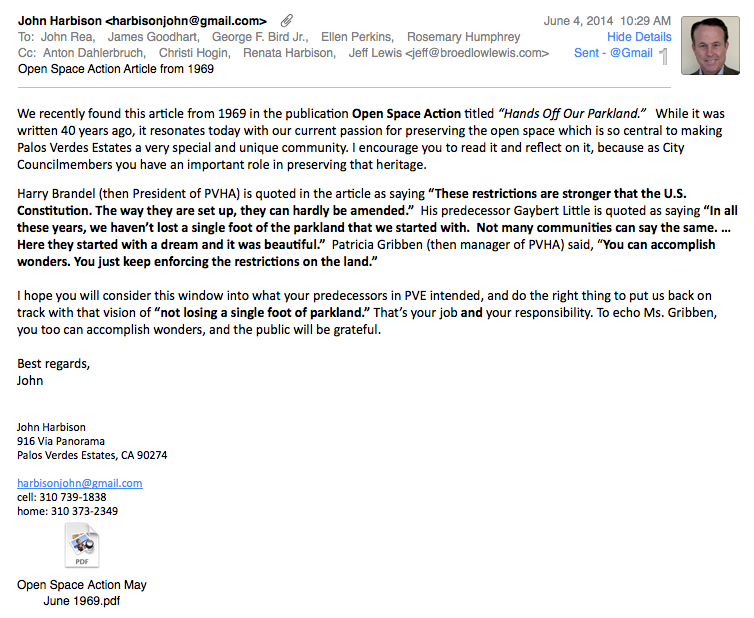 6/19/15 PVHA President sends letter in support of a proposal to fence off a popular hiking trail, in violation of Deed restrictions. For the letter, click here. For the Proposal, click here.